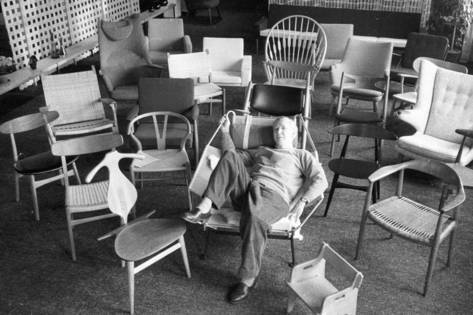 “If only you could design just one good chair in your life….But you simply cannot,” said Hans Wegner in 1952. 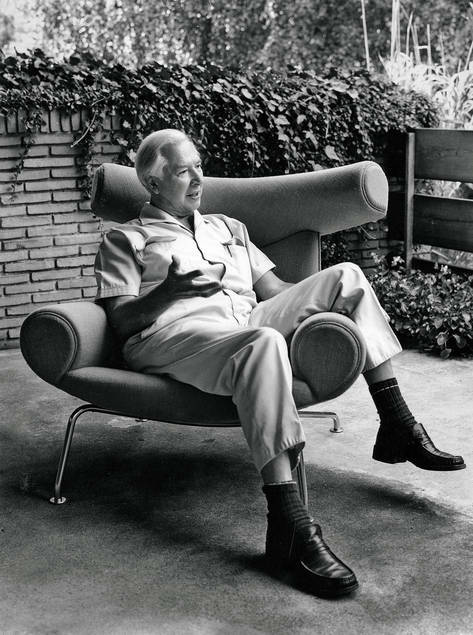 He is pictured here surrounded by his designs and lounging on the Flag Halyard Chair, one of his most radical and significant works. In addition to approximately 500 chairs, Wegner designed lighting such as the Pendant lamp, now available in a special edition that marks the centennial of his birth. A meeting of organic modern minds. 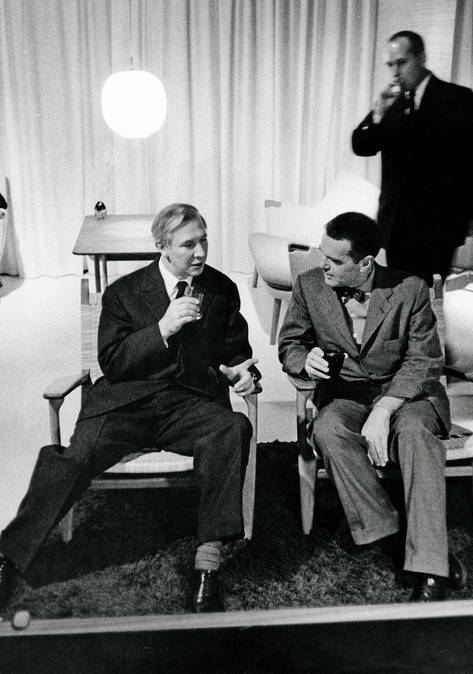 Wegner chats with fellow designer Charles Eames at the opening of the 1959 Wegner retrospective at Georg Jensen in New York. One hot summer afternoon in 1950, Hans Wegner was watching his children play near the ocean, but his designing mind didn’t pause for a beach day. He dug a hole in the sand, experimenting with sitting positions and finally creating a comfortable perch: one that allowed him to recline while maintaining an unobstructed view of his surroundings. It was a new way for a chair to hold someone. 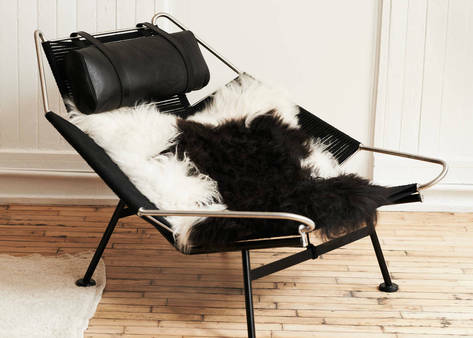 Back at his summer cottage, Wegner sketched out the angles from the beach and began to develop the form for the Flag Halyard Chair. The chair is made from stainless steel in a broad, wheelbarrow-like shape with angled sides, a form that Oleson compares to a stealth aircraft but at least one early skeptic likened to a chair for a gynecological exam. It is covered in nearly 800 feet of specially developed flag line that forms the seat and back. 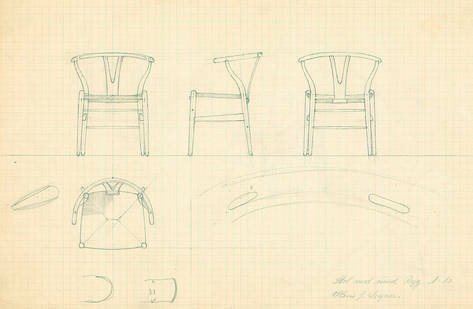 By attaching the ends of the plaited halyard to the stretchers beneath the chair, Wegner ensured that they could be tightened if they become loose. The angled legs are propped on large feet that visually anchor the form and protect the floor from scratches. 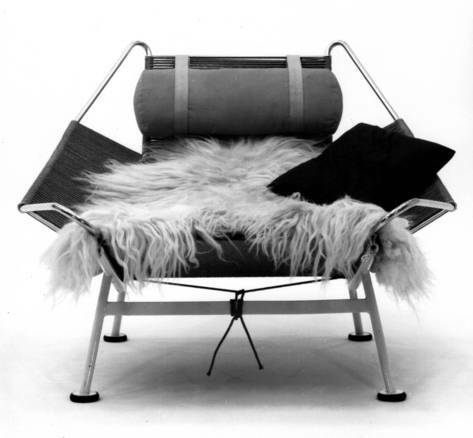 A long-haired sheepskin softens the industrial rigor of the steel.